Last week, I shared how to use an elevator rant to form the foundation for your elevator pitch. I challenged you to think about what your ideal client would complain about – knowing that you are the best person or company on the planet to solve that issue. But, if someone asked you what you do, you could not simply quote the elevator rant. So, how do you go from the elevator rant to a solid elevator pitch? First, recognize that everything I share with you is integrity-based. What I mean is that there is no deception, trickery, or Jedi mind trick involved. The goal is to share the truth to get to the truth in buying and selling situations. Let’s start with a foundation for your elevator pitch. Who Is Your Best Fit? Of all the people you meet as potential clients, what percentage of them are such a good fit that you are likely to do business with them? When I ask this question to successful CEOs’ the number is usually less than 5%. I have yet to meet a business that feels they are the best fit for more than half of the people they meet. Though you may hope for better odds. The reality is that for most businesses, less than 10% of the people you meet would be a good fit and likely to do business with you such that money changes hands. In our upcoming book, Same Side Selling, my co-author Jack Quarles and I share a concept called the Same Side Selling Elevator Pitch. The pitch starts with the elevator rant as the foundation. It then uses a formula with these three elements: Entice, Disarm, and Discover. (3) Discover: Trigger a discovery phase where you learn about them (instead of a meeting talking about your stuff). [Entice] We work with clients who are frustrated that their IT systems go down which costs them hundreds of billable hours. They tell us they can’t afford to continue facing that problem. For the right clients, we find we can help them rely on their systems to always be available whether they are in the office, or working remotely. [Disarm] We find we can have a dramatic impact on less than half of the organizations we meet with about this issue. But, if addressing those problems is important to you, [Discover] we’d be happy to speak with you to learn more about your situation to see if we can help. I shared this concept in a recent podcast interview with Tom Cooper from Brighthill Group. In case you missed the interview, you can listen to it here: “Dump your elevator pitch. What you need is a great “Elevator Rant!”. The goal of Same Side Selling pitch is to put yourself and the buyer on the same side of the table. Using this approach, you are trying to determine if you have a fit to solve an important issue. You are not just trying to sell something. 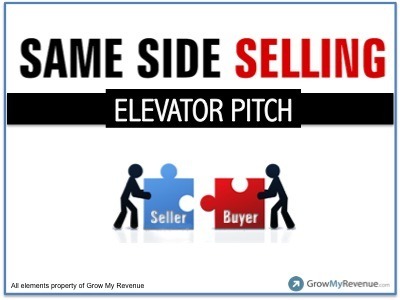 Share your Same Side Selling Elevator Pitch in the comments. We’ll be sure to offer feedback to each comment (no matter how many there are). You can also sign up for a free preview chapter of Same Side Selling at SameSideSelling.com. The preview chapter releases mid-November. What most forget to realize is today your potential customers are meeting with you because they think or have done some advance due diligence to confirm prior to your meeting that you and your company can solve their problem. From Upside Down Selling we learned that Issue, Impact and Importance (3-I’s) was the method to discover how critical your potential customer really needed your services/solution to their problem. From Same Side Selling we pair Entice, Disarm & Discover as the method to get to the 3-I’s. Marc – Bingo! You’ve got the secret formula. That explains why you are having so much success delivering results for your clients. Though many readers will be jealous that your entire business is based on the fact that you only make money when your client saves money.